Burnham and Weston Energy is using crowdfunding to take back control of the energy system. Many small communities in the UK find themselves at the periphery of a global energy system that drains value from the local economy and causes social and environmental problems. Burnham & Weston Energy is helping North Somerset take back control, kicking it all off with a crowdfunding campaign. With 13 years’ experience in the renewable energy field, Jake is now Managing Director of Communities for Renewables (CfR), a consultancy that helps local energy enterprises develop, finance, and manage their own renewable energy generation. He has seen first-hand how local renewable schemes can reduce energy spend, tackle fuel poverty and earn income to reinvest in the community. “Fossil fuel-based energy production require huge power plants that are expensive to build and have huge ongoing distribution costs,” explains Jake. “To maximise efficiency, it makes sense that this industry would consolidate and centralise over time. The problem is that this ends up stripping local communities of their energy assets and makes them dependent on large companies or central governments. One of CfR’s most recent projects is Burnham & Weston Energy in North Somerset. 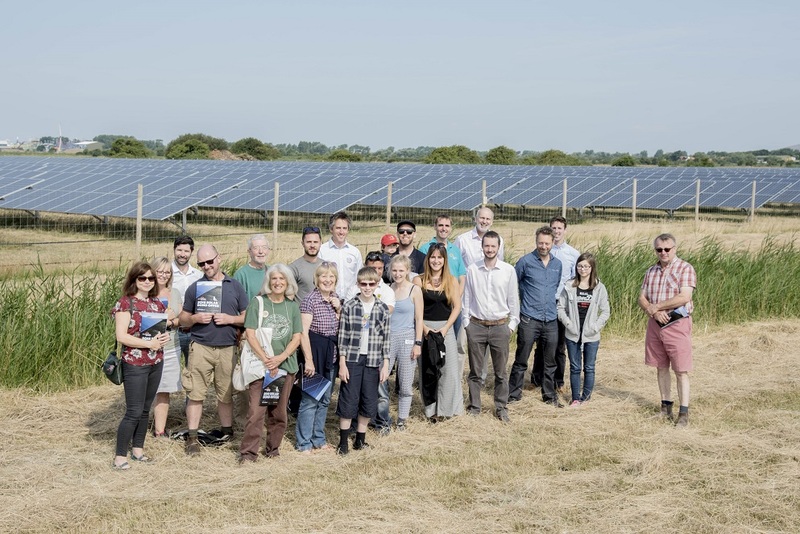 The 9.3MW community solar farm, located at Wick Farm between Weston-super-Mare and Burnham-on-Sea, has been in operation for nearly two years and currently generates enough carbon-free electricity to power the equivalent of over 2,000 homes. The solar farm is built on pasture land leased from a local farming family, who continue to graze sheep amongst the solar panels. With the right business model, a community can own, and benefit from, its own energy generation. Like most coastal communities, Burnham and Highbridge and Weston-Super-Mare are at the periphery of an energy system that drains value from the local economy and causes social and environmental problems. With over £360 million spent per year on energy—almost all of which leaves the local economy—10 to 20 per cent of households still live in fuel poverty. The Wick Farm scheme is working to reverse these trends by generating a surplus of around £3m over the 23-year lifespan of the solar farm. Half the surplus will be used to support ‘The Sunshine Fund’, a new grant-making fund to be managed by the local charitable trust Somerset Community Foundation. The other half will be used help households struggling to pay their energy bills through a fuel poverty advice service managed by the Centre for Sustainable Energy (CSE). To make this happen, Burnham & Weston have launched an investment crowdfunding campaign to offer the public a chance to invest. Through bonds available on the Triodos Crowdfunding website, investors will receive an initial interest rate of 5 per cent a year, which will rise every year with inflation. The 18-year bonds have a minimum investment of £200 and are eligible to be held in a Triodos Innovative Finance ISA which allows investors to earn interest tax-free. Like all ISAs, the IFISA has eligibility criteria. Unlike bank deposits, an investment in Burnham & Weston’s bonds is not covered by the Financial Services Compensation Scheme. Payment of interest and repayment of capital are not guaranteed and are dependent on the continued success of Burnham & Weston’s business model. The bonds are not listed on a recognised investment exchange, so investors should be prepared to hold the bonds for their whole term.